If you have been blogging for a while, then you understand the power of affiliate marketing as a method to generate income online. Basically you need to write some good content and then place targeted links of products or services you think your audience would be interested in. It’s a bit more complicated. Making researches, understanding your audience needs and problems, producing very interesting and useful content, having a solid reputation online and building good authority, creating a nice and clean website layout, and finally using the right tools are all factors that influence your success in creating income with affiliate marketing. With reference of the last point mentioned, it’s surely important to use the proper tools, like the right WordPress plugins, which can help you during your work. In this post I am going to write about “WP Product Review”, a plugin that offers a fast and simple way to add several functionalities to your blog posts and pages, like creating nice graphics with different options for your reviews with pros and cons of the product or the ability to easily insert affiliate links. Also, be sure to to enter the giveaway at the end of the article. There are 3 single site licenses for the Pro Version of WP Product Review plugin waiting for you (each worth $26.95)! First, grab the free version of the WP product review plugin here and install it in your blog. Or simply use the search box within the plugins menu of your WordPress dashboard. Once you have installed it, you’ll notice the “Product Review” menu added in your blog dashboard. Clicking on it, will bring you to the settings of this plugin. There are several options available, this is because you can create personalized graphics for your reviews. Let’s see the settings in detail. Here you want to set the position of the review box, if after content, before content or manually placed (using different codes depending if you have installed the free or pro version). Then decide whether to show or not the review comments, by allowing your blog visitors to rate every point of the product you are writing about in your review. You may also select your visitor review influence, in other words how much visitors rating will affect the main one (from 10% up to 90%, or no influence option). The “change default rating icon” and “number of options/pros/cons” options are only available to Pro users of the plugin. Finally, set the content width of the review widget (just enter the number in pixels – mine is “600”, the maximum width of my blog posts in my Genesis Framework theme). Browsing in the menu on the left, you see the rating colors option. By default, you see red color for a weak rating, yellow for not bad, blue for good and green for very good rating. 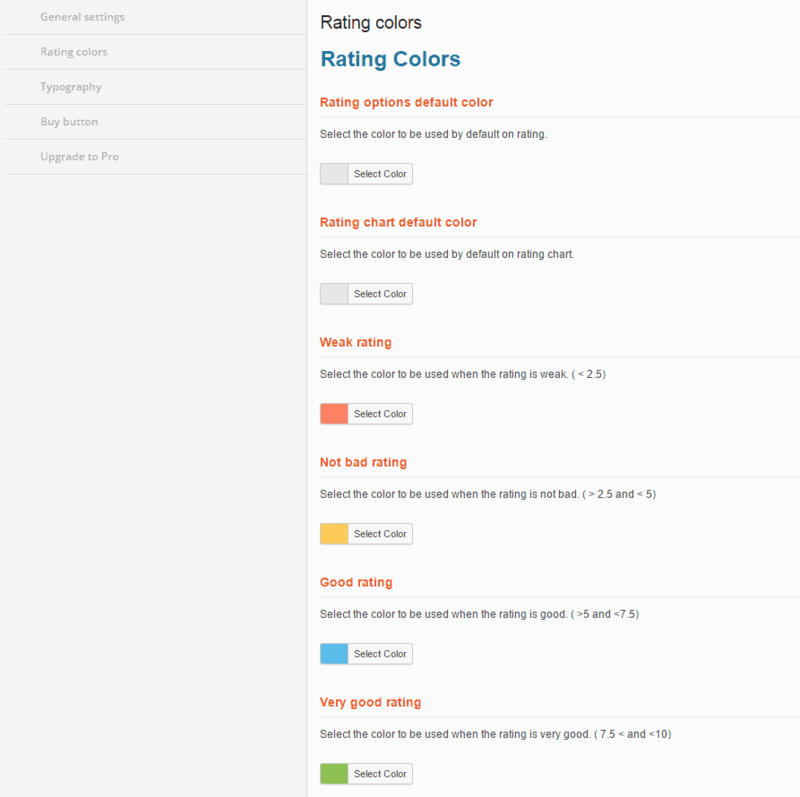 It’s also possible to change the “rating options” and “rating chart” default color. You can personalize the colors, by choosing the tonality you prefer, just be sure to tweak them in order to match your main blog theme. The “Typography” section of the WP Product Review plugin helps you edit the “font” color, together with “pros” and “cons” text colors. Also, you may want to specify the text for pros and cons headings, by modifying them to “strong points” and “weak points”, for example. You can change the review box border color and width, by inserting the number of the pixels you prefer. The second-last part of the menu is the “buy button options”. Here you want to select a color for the button border, background and text color, together with the hover options. Also, you need to choose whether to show a shopping cart icon on the button. The last part of the menu is “Upgrade to Pro”, where you can purchase the Pro version of WP Product Review plugin for $26.95. In the “upgrade to Pro” tab, there is an interesting option. You can choose to use the preloader functionality, by displaying a “powered by link” (which will be nofollow) on your review posts which points to the plugin. Save all your changes and you are now ready to create your first review. So it’s time to create your first content, using WP Product Review. After having installed properly the plugin, when creating new blog posts you will notice a new addition within your “screen options” of your WordPress dashboard. In order to write your first review, just click and save “yes” in the product review extra settings. After saving, new boxes of information to fill will appear. The first part is related to the product details – the product name and image, or the choice to link your picture to the affiliate link or simply to the image (of course when writing reviews you want to add your links). The next box is where you want to write the product options settings, with their grades. As finally step, you need to enter “pros” and “cons” features of the product reviewed. The free version has many interesting features, and you can start creating awesome reviews in your blog just by using the lite plugin. While upgrading to the Pro version will ensure you more usability, with some more features. WP Product Review is a great solution for boosting your affiliate marketing results. I liked the many options available and even if it takes a bit to understand how to use it, after the initial set up, then it’s very simple to build nice reviews. The review box of the plugin has really a beautiful graphic and will add a clear understanding of the product to your readers. You can choose to display it at beginning, so to give your audience an overall view of your review. I highly recommend to take a look at this plugin to all the affiliate marketers out there. It could help maximizing your revenue! You may want to enter the giveaway, for a chance to win one of the three single site licenses offered. Just follow the steps included in the PunchTab as below (mandatory is only leaving a comment). Have you ever heard about WP Product Review plugin? Thanks for writing this great review of WP Product review plugin. I really like the functions the plugin can perform. I just entered your giveaway, hopefully i would be one of lucky winners of the giveaway. Take care and have a nice day ahead. glad you enjoyed the explanation of features of this plugin. It’s a great tool that may help you with affiliate marketing. Good luck with the giveaway and thanks for your comment. Have a great beginning of this week. That was a wonderful and straight forward review! I thought this review was on Author hReview until I read down the post. Well, I have been using Author hReview free version on my blog and have used it to write couple of reviews. Seeing the features of WP Product Review makes want to think if it’s cooler than the one I am using. I think I will give it a shot and see how it goes and then make a decision because I really need to have one of those especially as I plan on writing more review starting next year. All the same, thanks for sharing. It was indeed a great read. BTW I am entering the contest right away! WP Product Review lets you create amazing graphics, and colors are highly customizable. I definitely will start using it for my next reviews. I suggest you to give it a try! Good luck with the giveaway and thanks for your comment, Jackson. I was totally unaware of this plugin up until now. So, thank you for making me aware of it and for giving us the opportunity to win a license. I’m so glad I saw this on Triberr. glad to see you here and know you are visiting thanks to Triberr. Good luck with the giveaway, and thanks for leaving your comment. First of all Great Review. Direct, Straight, Go to the Ponts. When i saw the Headline i think you should review about Author hReview because so many bloggers review about the particular pluggin. After know about WP Product Review Plugin , i think ohh.. There is another plugin also avalaible in WordPress Plugin Store behind Author hReview to Review Aff. Programs. as Jackson mentioned in his comment, you too are aware just of Author hReview. It’s good to know of other alternatives and you can check yourself if you like this plugin. By the way, have you entered the giveaway? You have the chance to win one of the three single site licenses (for the PRO version of WP Product Review) offered. Not i don’t know about Aff. Marketing, but i m learning now… If i won the giveway but don’t know how and where to use it, then its just waste. So, first i know everything about Aff. Marketing, then……….. Thanks for your honest reply. P.S. Just replied to your email. Thanks for the Posts Erik! I’ve replied to your email. My main source of income is affiliate marketing so, I need to some new amazing tools that could enhance my career further in affiliate marketing. The product you mentioned above looks truly awesome and customization seems so easy and design is so stunning. I am going to participate in the giveaway right away! thanks for your kind feedback. Glad you enjoyed the information about WP Product Review. But when I clicked on Tweet, it was a exceeding the limit so I needed to delete some part of it and managed to share it over my social networks. Have a good one, Nikhil. I’ve not heard of WP Product Review before but it looks like a good solution to adding ratings to reviews. I like the fact that the pro version has a shortcode option. There’s certainly a wealth of options in the free version though too. I appreciate you giving us the opportunity to enter the giveaway too. I’ll keep my fingers crossed! I’ll use this plugin for my next review. I like the graphics that produces and it surely helps understand at a glance what the post is about. Good luck with the giveaway and thanks for leaving your views here. Have a great day, my friend. Thanks for writing this great review. Be sure to try WP Product Review plugin. This post revealed all important info regarding the Affiliate .marketing which is one of major earning source for blogger. btw nice post. Glad you liked the reading. Btw can you tell me which template you are using its very professional and good looking as well as well organized. Glad, that I won. For this I really thank you for it for hosting this ultimate giveaway! I used the plugin and it was super amazing. I truly recommend it to everyone. it’s a great affiliate marketing tool. I missed out on this giveaway! However, going by the review of the WP Product Review, I think its a cool plugin with many admirable features that give the affiliate marketer better control! I am going to test out the Free version for now. Hopefully, it would spur me to upgrade to the Pro Version! This comment was shared in kingged.com as well. I love how WP Product Review works. It adds really nice graphics. It’s a great way to increase affiliate marketing earnings. First time on your blog but was receiving updates through social media and one thing i can say is, you have wonderful blog. Coming to this blog post, i was not aware of this WP product review but definitely going to try this. Thanks for sharing !! I really appreciate your kind words and support. Glad you enjoyed this post about WP Product Review. It’s a great one for affiliate marketing. Affiliate marketing is a great tool to earn passive income. But, this weapon only come into use if one knows to operate it. In order to maximize your revenue, the tricks mentioned here can be really helpful. One must apply these techniques to boost his revenue. I use ShareASale and I personally like it very much. The offers in this network are really awesome and pays high commissions. thanks for sharing your experience with us. I use ShareASale too, glad to hear it’s good for you too! Affiliate marketing is a great way to earn passive income. But this comes to use only if one knows how to maximize the potential. The above mentioned techniques helped me to boost my revenue. Awesome Article, can you tell me which template you are using its very professional and good looking as well as well organized. The template I’m using for this blog is a personalized “Magazine PRO” theme, from Genesis Framework. thanks for revealing such a great thing with us. very well explained post is this.i am going to try this and hoping that it will work. Can you share your theme ? The site is hosted on a dedicated server with HostGator. The theme is a personalized child theme from Genesis. Good to hear you learned something new here, Pankaj. This is the really wonderful plugin to give the best reviews. Thank you so much for sharing each and every aspect of this product. Thanks for the thumbs up, Satya. I am on blogger and going to WP so i am searching more plugins and their review. Thank for this great review dear sir. I wrote down this plugin. Glad to have you helped, GuRu. Many sites such as Android Authority was posting about reviews of mobile phones. I was not aware that which plugin they might be using. Good to hear you learned something new here, Xaif. Bro I want to create an affiliate website of online shopping sites selling product suggest me which of thing I need to know for better sale. When it comes to affiliate marketing. It is as important as earning from adsense. This plugin is going to help for sure in boosting earning. will it effect my website speed as using more plugins slow down website speed? Every plugin affects in a certain percentage the loading speed of a WordPress website, Adarsh. which creates a profile of your WordPress site’s plugins’ performance by measuring their impact on your site’s load time. This Plugin is great and you have reviewed in a good manner. I am going to buy it thanks for the info you provided. Thanks for the positive feedback, Dhruvhat. nice plugin. I have used it. Btw which theme you are currently using on nopassiveincome website? a few days back i saw same plugin on one website and then searched for the same plugin but unfortunately couldn’t find it anywhere. But today here i got to know about this. Glad you found it now thanks to this post, Pankaj. Glad you found WP Product Review plugin useful. I appreciate your work towards this plugin. WP Product Review plugin is a handy blogging tool. Well, the information is truly a good thing to get bookmarked. This plugin will truly help for the affiliate marketrs. I loved the way you have written it. Looking for more such great posts by you. Thank you. I hope this WP plugin is going to help you with affiliate marketing. Thanks for sharing your experience with WP Product Review plugin, Maknoo. Good to hear you found this plugin useful, Dhruvhat. Good to hear you found this post useful, Rajinder! WP Product Review plugin is awesome, so the founder and creator: ThemeIsle. This is called balanced review thanks for letting us know about this awesome plugin. i use the kk star rating on my blog . but my blog is not a woo commerce site. But, I interested use wp product review plugin. Can i use it! Sure, give wp product review plugin a go, Abhisek, and let me know your feedback. i am working for many affiliate program like flipkart, amazon and investing but focused for finance related affiliate programs. 27 dollars, I don’t think I can use it on my new website, Is the free version worth? I really like the functions the plugin..
Congratulation Great new but is there any free trail?? Going to use this plugin. Is this plugin supports Google Schema also for rating view? Excellent plugin! thank you for the tutorial. Does it include pros and cons section?